Mary loves all flowers, but the Orchid is her very favorite. 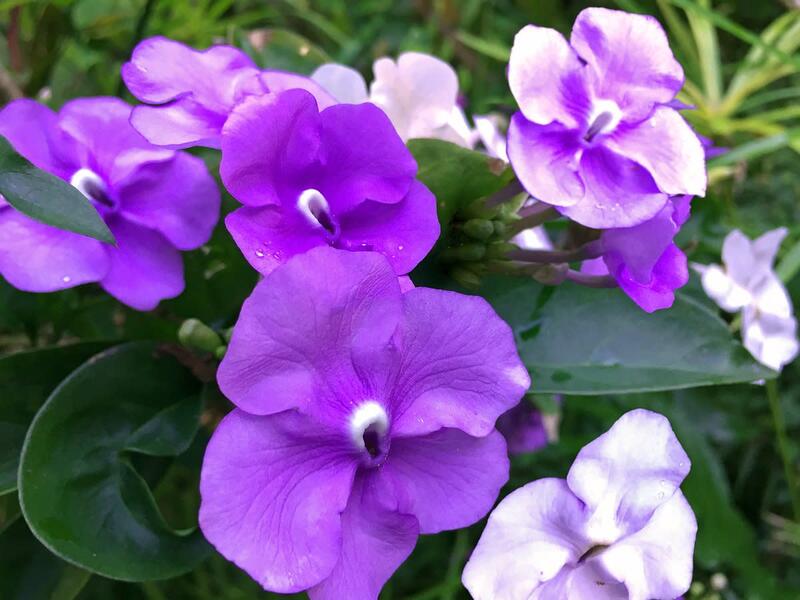 She encourages people to grow this beautiful and rewarding flower. One of my daughters gave me this beautiful Cattleya orchid for Mother's Day in 2003. It was in full bloom with two huge purple and lavender blossoms. It was undoubtedly the most beautiful orchid I have ever seen. I never thought I'd be able to keep it alive let alone enjoy it for nine years! But this orchid has lived and it rewards me each year for Mother's Day with its outstanding beauty. I am certainly no expert in growing Orchids. Through trial and error I have found what works for me. The orchid is a favorite flower of mine (well, the rose is also a favorite). People sometimes won’t grow Orchids because they are afraid of them. Yes, afraid! I was afraid of being a failure until I tried. I was surprised to find out I can grow these beauties with just a little effort. The Orchid will reward that effort with beautiful blooms. Mine only bloom once a year, but I think that is usual. I can still remember the first orchid I ever received. It was from a boy that took me to the Junior-Senior Prom. It was a hug purple-lavender single blossom that I know now was a Cattleya. I kept it in our refrigerator for a long time, and then I pressed it between the pages of a book. I think I forgot all about it. Who ever received that book from our local library (where I had donated the book) was surprised to find my orchid between the pages I’m sure. I will share my limited knowledge with you about growing the Cattleya Orchid. If you really get serious about growing these lovely air plants I’d suggest you search the internet. There are many sources there. Most towns have an orchid society. One of things I learned the hard way: When you buy an orchid from the nursery the first thing to do is to repot the plant. When you buy the plant, get a clay pot made especially for orchids. You can buy wooded slatted baskets, but I find these rot too quickly. Buy a bag of orchid media. Just follow the directions on the bag to repot the orchid. I was scared to death the first time I did this for fear of killing the plant. I still get very nervous when I repot my orchids. They are tough plants, though. I don’t remember ever losing an orchid because of my method of repotting. When we took a vacation in Costa Rica, I was amazed to see orchids growing in the rain forest there. We forget that the orchid is an air plant called Epiphytes. The roots grow from the top. They look really strange growing all down the pot. Look at the way the roots have grown on mine in the photographs. As I said before, one of my daughters gave me this orchid for Mother’s Day in 2003. I have repotted it once. This orchid blooms once a year around Mother’s Day. 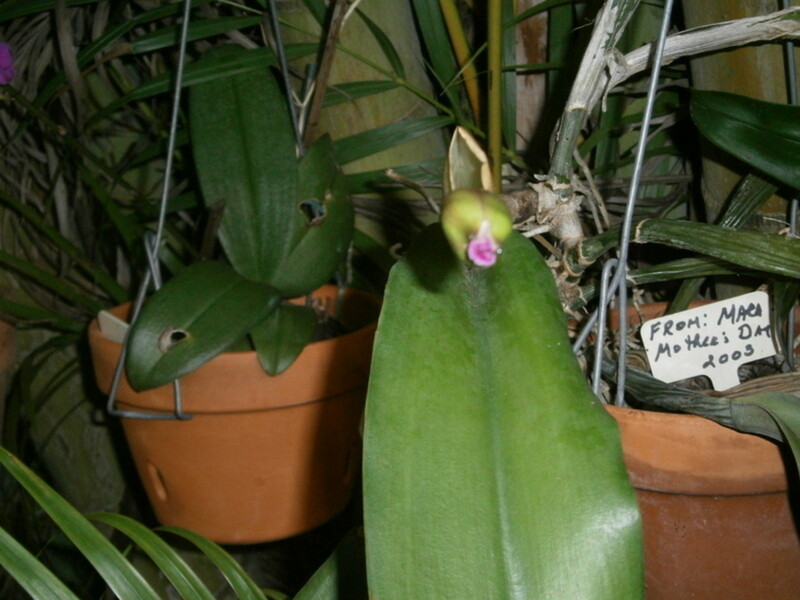 Orchids like to be root-bound, and their roots will protrude from the top of the orchid medium, and down the pot. When this orchid finishes blooming this year, I will be brave and repot it because I think it needs new orchid potting soil and maybe a larger pot. I live in South Florida where it gets very hot in the summer. The leaves on these plants will burn so they must be kept in the shade. I hang mine underneath the palm trees. Orchids like the temperature from 65 to 85 degrees. When our weather gets down to about 40 degrees, I bring mine into the house because the cold will kill them. They are a tropical plant, after all. Like all plants, orchids need to be fed. I’m bad about forgetting to do this, but they should be fed a special orchid fertilizer every other watering. When they are watered the water should pour right through the media and out. Since they are not in soil, you can’t help but wonder if the plant is getting any nutrients, but I guess they do. I hope this beautiful Cattleya orchid will bloom for many more years. It makes me happy just to look at it and remember the loving daughter who gifted it to me. I hope she gives me another one this Mother's Day! I was so thrilled this year when I first saw the bud on this Cattleya begin to swell telling me that it was about to bloom again. This will be the nineth year it has bloomed. I watched it every day to see it progress. I took photos as it went from bud to bloom until it finally burst into bloom. I wish I had a better camera to capture the progress, especially the bud. It is truly a miracle of nature. The time it took from bud to blossom was about 4 days. I hope you will enjoy seeing my pride and joy in this Cattleya orchid. This is about my family's vacation to Costa Rica, and our adventures while there. Hi, Shyron E Shenko Yes, the Orchid is definitely one of my favorite flowers. Most people don't realize how easy they are to grow, and that is really a shame. I'm glad you like Orchids,too! I love Orchids also, and I never knew that there were different kinds of Orchids. I wrote a poem for my mom and brother about the Orchid. I can't remember if I published but I sealed the blossom in plastic. I am so happy that you can enjoy your Orchid year after year. Hi, poetryman6969 Oh, yes, growing Orchids is a very rewarding hobby! They come in so many beautiful colors, plus they are easy to care for! Growing orchids seems like it would be an interesting hobby. 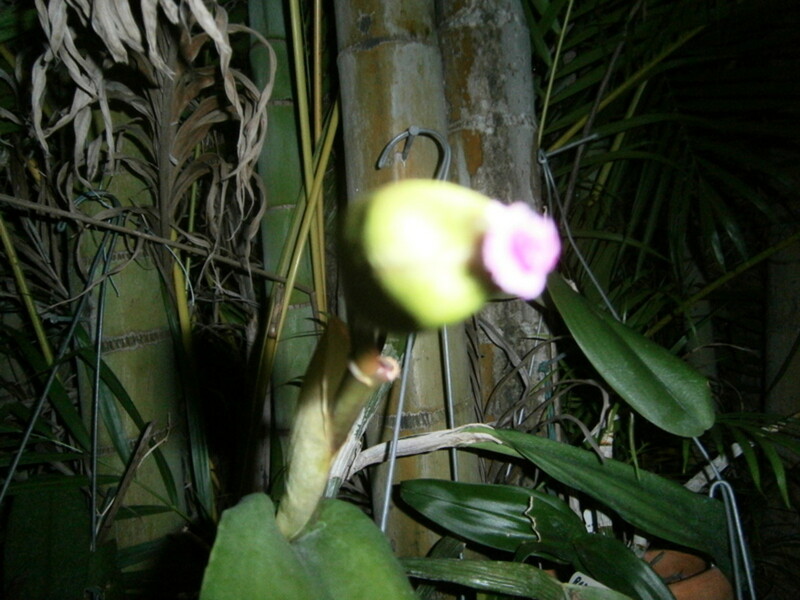 Hi, ChitrangadaSharan Yes, it is very exciting to see the Orchid from bud to full bloom! 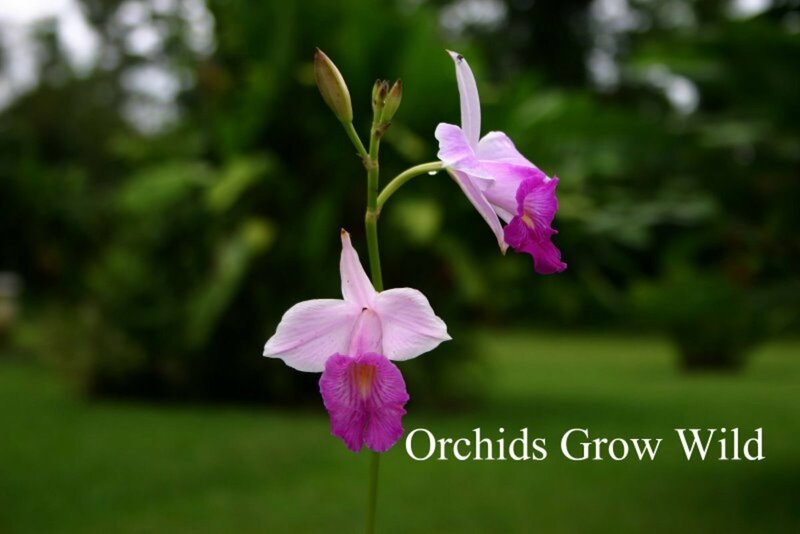 The Orchid is so easy to grow, you would be amazed. Beautiful and emotional! How exciting to see a cute bud blossom into a flower and that too an Orchid. I just love Orchids in all colors. But this color you have illustrated is so bright and lively. Enjoyed going through your well presented hub! Voted up! Amazingly beautiful. Now I want one. 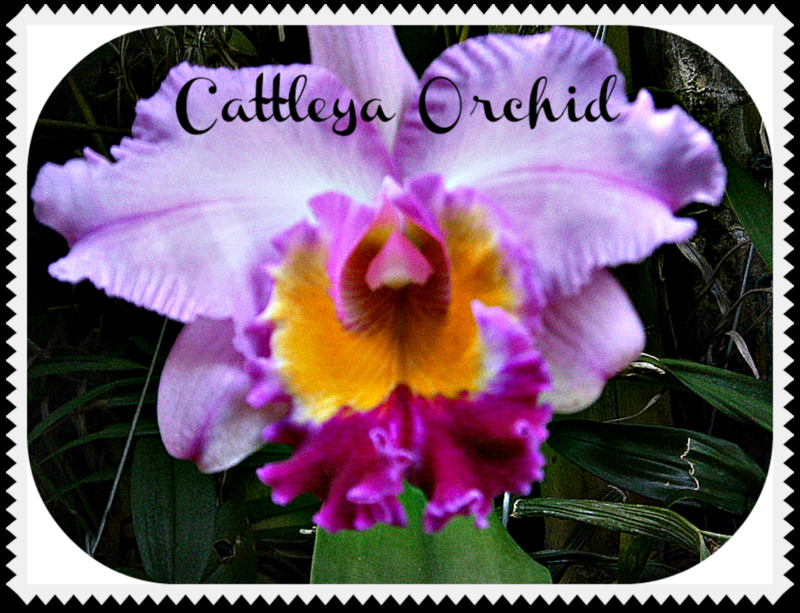 Hi, DealForALiving I am so happy to introduce you to a Cattleya Orchid! They really are a beautiful flower. This one blooms year after year! Hi, CassandraCae Orchids are really easy to grow if the conditions are right for them. They can't stand to be cold or too wet. Sometimes people overwater them, and they will rot! 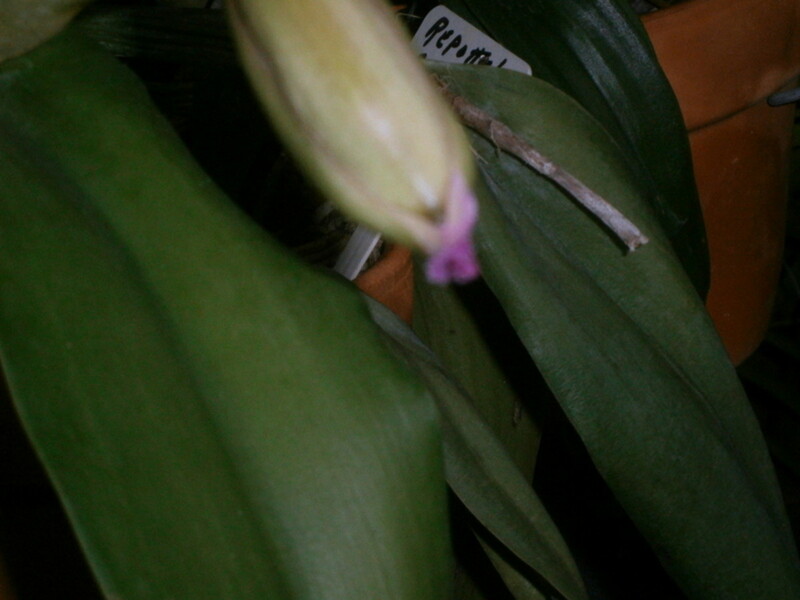 Hi, Scarlettohairy I hope you were successful in keeping your Orchids alive to rebloom. Hi, colorfulone Thanks so much! Orchids are really easy to care for so they will rebloom again. 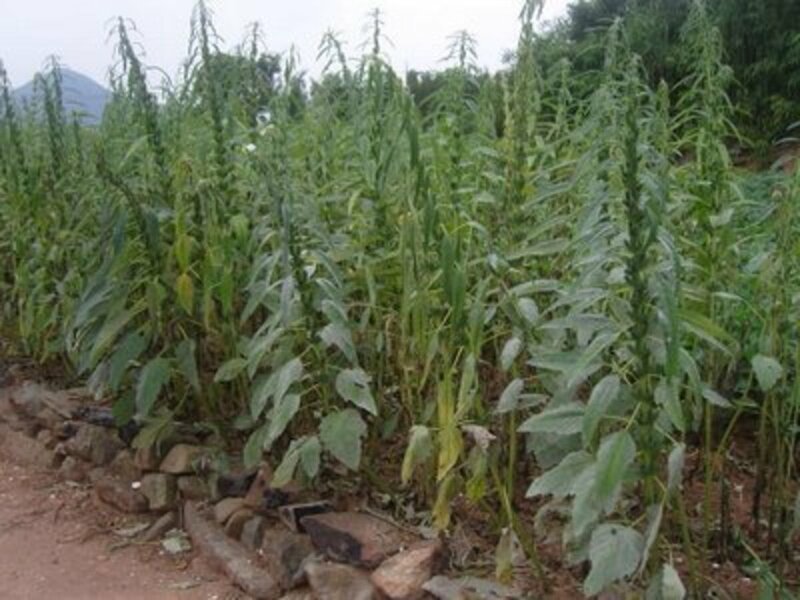 They are actually a very tough and forgiving plant. Maybe you should try another one! I've never seen one of these before so this has been a treat. Beautiful plant, looks amazing. My orchids always die but we have one outside in the garden that will bloom when the weather is right. What a beauty. My daughter gave me a couple of orchids once that I struggled to keep alive. Yours is wonderful! 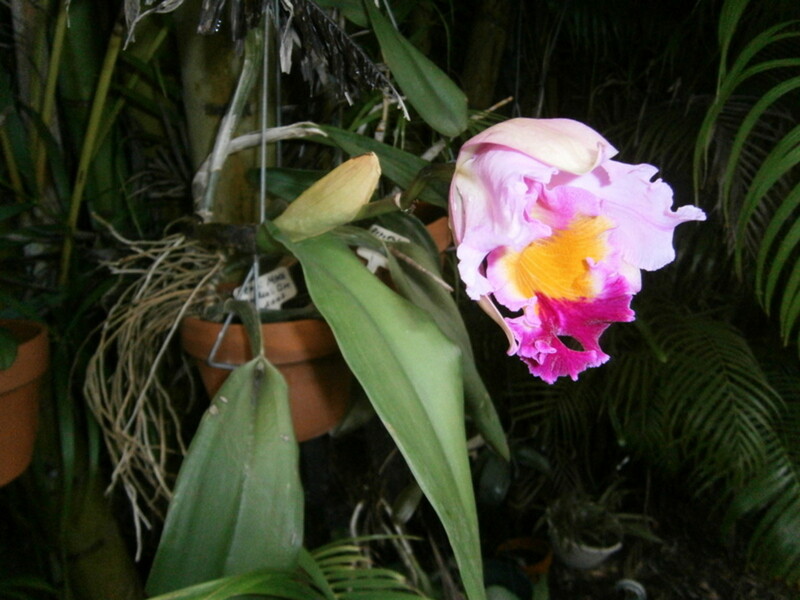 Mary, I am glad that you have been able to keep your Cattleya Orchid alive and blooming. It must mean a lot to you being a gift from a loved one. My sister in-law gave me an orchid years ago, and it just didn't last for me. You must have a green thumb. Hi, Nell Rose. I'm so happy you enjoyed reading about my Cattleya Orchid. It bloomed again this past Mother's day, however, it only had one blossom instead of two. It was quite beautiful. Hi moonlake So nice to see you!! Orchids are a very hardy plant. They surprise people who have never tried to grow them. This Orchid has bloomed every Mother's Day, and I see right now there is a bud coming out, so I look forward to seeing it bloom again. I'd encourage you to try another Orchid; you might be surprised. I love orchids but I have never had good luck with them. Enjoyed your hub and voted up. Hi pstraubie48 I'm happy you think my orchid is pretty. I look forward to this one blooming every Mother's Day. Yes, do grow an Orchid, they are so easy and very rewarding with their beauty. pstraubie48 Gorgeous thank you for sharing these...I do so want to grow some of my very own..
Hi, Eddy. I'm glad you found my Hub on my Cattleya Orchid. It is not blooming at the moment, having finished it's beautiful display for Mother's Day. Thanks for reading and commenting, and I do hope your weekend is going well for you, friend. I must have missed out this one. truly beautiful Mary. Enjoy your day. Hi midget38. This Orchid bloomed again this Mother's Day. By the time I got a new digital camera it was too late to capture it this year. I really wanted to post a new photo on this Hub. Yes, it truly is a beautiful Orchid. Now that is a lovely orchid. Your knowledge of gardening is awesome! Am sharing! Wow what a beautiful example of a Cattleya Orchid. You are very impressive to have nurtured this for 10 years and it is still looking excellent. You certainly have green fingers Mary. Well done and happy mothers day. Hi pstraudie48. Treat yourself to just an inexpensive orchid you can get at Home Depot and it will reward you for a long time. It is probably too cold right now to put an orchid outside where you live, but they do well indoors. When the temp. dips down to 50 or under, I bring mine indoors. They really are a tough plant. O, I have wanted an orchid for so long. I actually have pretty good success with plants of all kinds but I admit it. I am intimidated by the beauties. After reading your article. 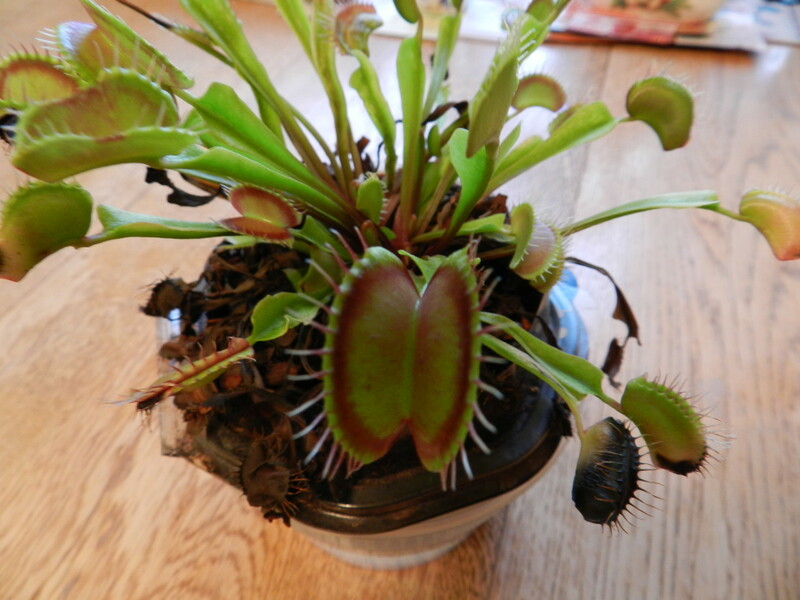 much of the fear has been taken out of care and repotting. I am bookmarking this and I think I may see an orchid in my near future. Hi, vibesites. I can't tell you the thrill I get when I see a new bud on this Cattleya Orchid, then to watch it unfold into a magnificent blossom is just unbelievable. Hi, Joos99. I'm so happy your lily bulbs have performed well for you. Sometimes we are amazed at plants: they grow in spite of us. The Orchid reminds me of a Poodle dog. People think Poodles are difficult to care for when actually they are a very tough dog. Orchids are like that. Just keep trying different kinds of plants, and you'll get better and better. Mary, it is very beautiful and looks so delicate too. What a thrill for you to have nurtured it to blooming. Gorgeous photos and I definitely got the sense of time lapse with the photos of its various stages of opening. I am not great at growing flowers, though I did buy some lilly bulbs last summer for £1 for 4 bulbs and they were real bobby dazzlers - gorgeous, probably a one off though! Hi, unknown spy, I have to agree. The Cattleya orchid is my very favorite of all the orchids. They are easy to fall in love with. Thanks for reading and commentng. Nice to meet you, too, jpcmc! You should write a Hub about your orchids and take lots of photos. I'd love to see them! Goodnight. Hi mary615. It's nice to meet another orchid lover. Having a tropical climate has its perks when it comes to raising orchids. My dancing ladies bloom several times a year, my cattleya is also a happy bloomer. Hi there, jpcmc. You and I both love orchids, don't we? I think most people are just afraid to try to grow them. After I got my first one about 10 yrs. ago, I was hooked on orchids! This orchid only blooms once a year, sorry to say. I love it so. Goodnight. Cattleyas are gorgeous. The photos are great s well. I think I'll do the same with my flowers. Orchids do return kindness with a display of their beautiful flowers. Hi, cabmgmnt. Good to see you. 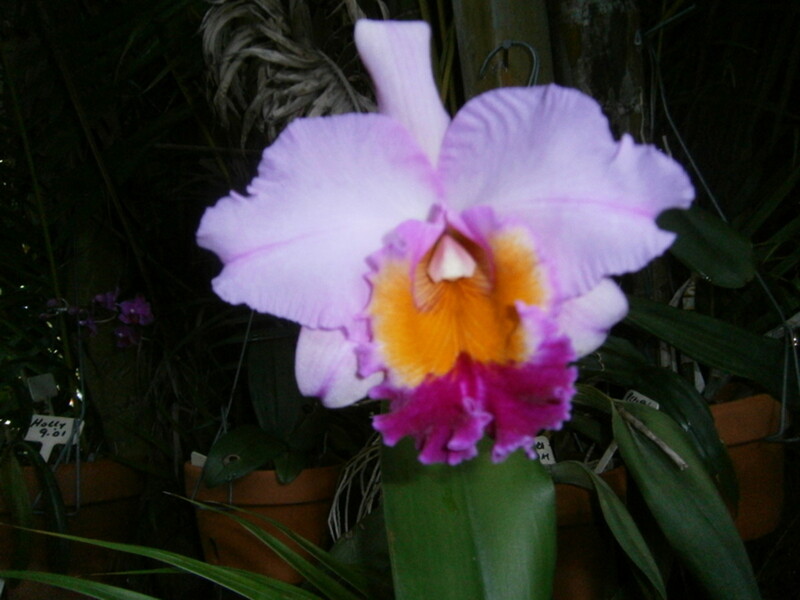 Thanks for reading and commenting on my Hub about the Cattleya orchid. The blossom finally fell off about a week ago,and it won't appear again until next year (if I'm lucky). I really was a thrill to see it bloom! Hello again, I love this hub especially the photos showing the blooming process of the orchid. Thanks for sharing. Love your photos, Mary. Your orchid has personality! Good morning, AliciaC. So nice to see you today! Thanks for reading about my Cattleya orchid. I'd encourage you to grow these beautiful flowers. They are so rewarding, and they really are easy to grow. It's been 8 days now, and mine is still in full bloom. I hope you have a wonderful day! BTW: your kitty cat is beautiful. I have never grown orchids, but I'm tempted to do so because they are such lovely flowers. I think it's wonderful that your orchid has bloomed every year for nine years. What a beautiful Mother's Day gift! Thanks for the instructions for taking care of orchids - I'm going to need them if I get any of these flowers. Hi there, molometer. Thanks for reading about my Cattleya orchid. You did a great Hub on Moth orchids. They are pretty tough orchids. I have about 5 of them, but none in bloom right now. I wished they bloomed longer than just a week or so, though. Thanks for the votes. I appreciate that. Goodnight. Hi again, Lesley. I'll be anxious to know how you do with the orchid. Don't forget to repot it when you get it home. Good luck. Keep me posted as to how it is doing. Goodnight. They are truly beautiful. The more I learn about them the more impressed I am. The Cattleya Orchid is stunning. The video was interesting too. Hi again Mary, thank you - I will choose one this weekend! My poinsettia still looks the same as it did at Christmas, everyone is making jokes about it and saying it's artificial!! Hi there, Lesley. 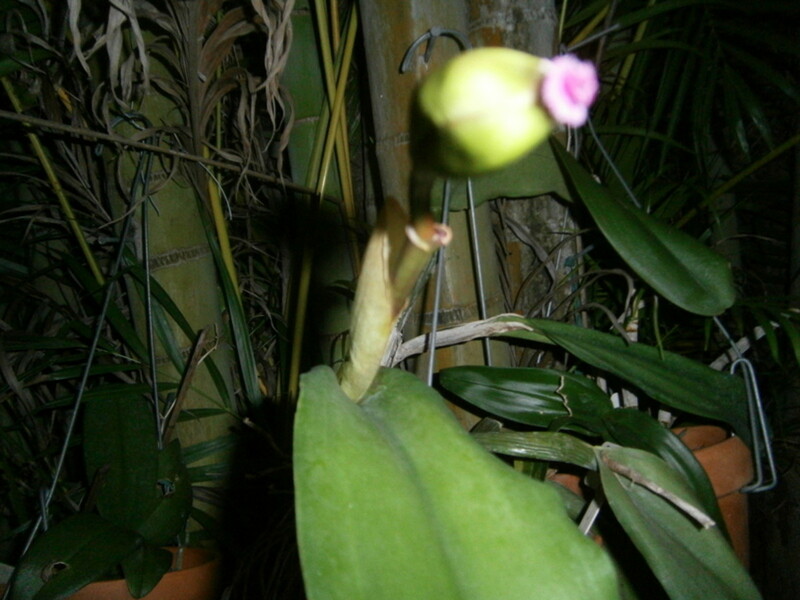 You certinly have a green thumb when it comes to plants, and I am sure you would be successful in growing orchids. Start out with just a little "cheapie". They sort of grow in spite of you, not because of you. They really are a tough plant. Yes, my pointsettia is still looking great. I don't think it's growing any, but is still in bloom. You can leave the orchid outside as long as the temp. is warm. They are like me: they don't like to be cold~ Thanks for taking the time to read and comment on my Hub. Hello Mary, I have green fingers in the garden but never have much luck with indoor plants, I am going to try growing a orchid! 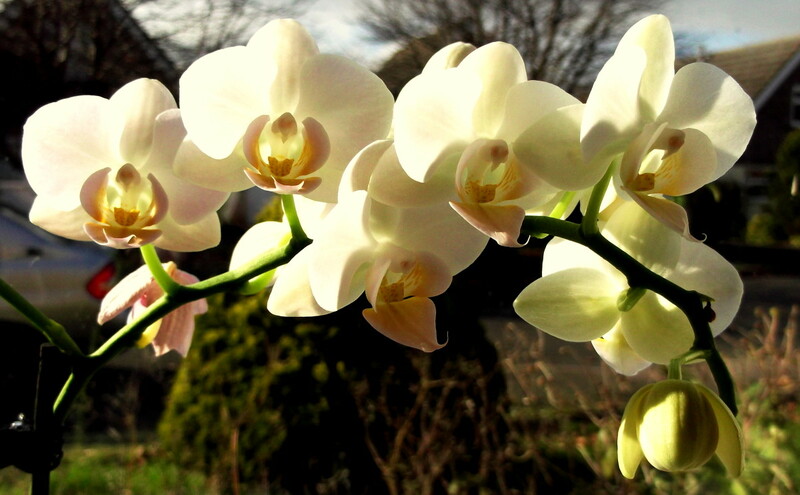 Your orchid is beautiful, how lovely to see the photos of it growing and blooming! BTW my pointsettia is still looking good, I am quite proud of it!! - do you still have yours? Hey there, drbj. I don't know about the 50 years (on my part). The orchid may still be around at the rate it's going. I wish I had more of this kind, it is so beautiful. Have a great day. Your orchid, mary, is fortunate to have found you. May you both continue to flourish for many, many, many years. At least 50 more! Good Morning, Hyphenbird. So nice to see you. I do so enjoy looking at this beauty. I'd encourage you to try an orchid, you'll be glad you did. I hope your day is blessed. It is beautiful. Thanks for the tips and information about orchids Mary. I might try one. I do love them very much. Hi Talloni! Good to see you today. Thanks for your nice compliment on my Cattleya orchid. Yes, Costa Rica is a wonderful place filled with wild flowers. You would love it there. Thanks for the vote, I appreciate that. Hope your day is a wonderful one. Good Morning, Stephanie. 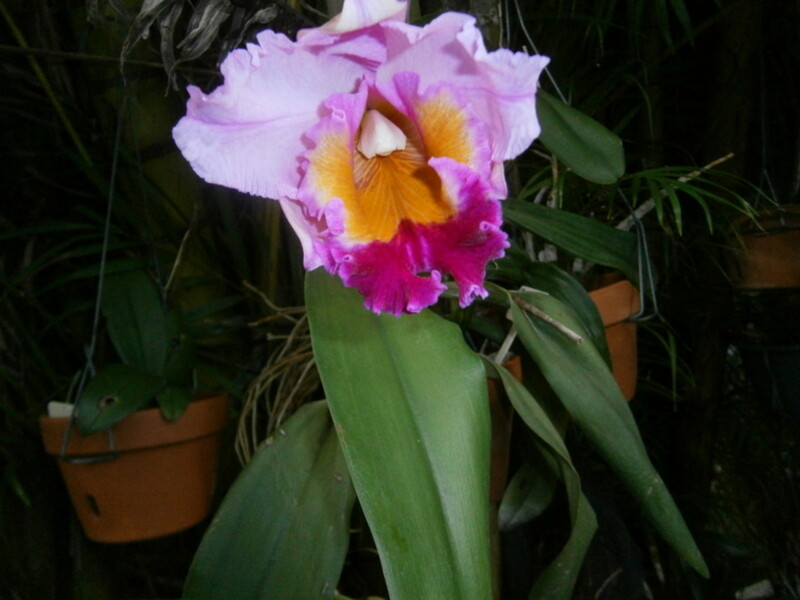 Thanks for reading my Hub about my Cattleya orchid. I wish I could take great photos the way you do. Yes, a traveler such as yourself couldn't keep house plants, but your outside plants are wonderful. Have a great day. Oh what a pretty orchid--thank you for sharing it with us, and the info with what you have learned. How special that your daughter gave it to you and you've been able to nurture it all these years. Imagine what Costa Rica must be like! Your orchids are so beautiful! I would love to have orchids, but since we travel part of the year, I stay away from house plants. These are gorgeous, though, and I love your photos depicting each phase until the bloom! Hi writer20. I agree: orchids are totally beautiful. I really enjoy growing them. It's too bad you had to sell yours. Some people I know grow theirs inside the house, but I never did that. Thanks for the vote. I appreciate that. Goodnight, Joyce. 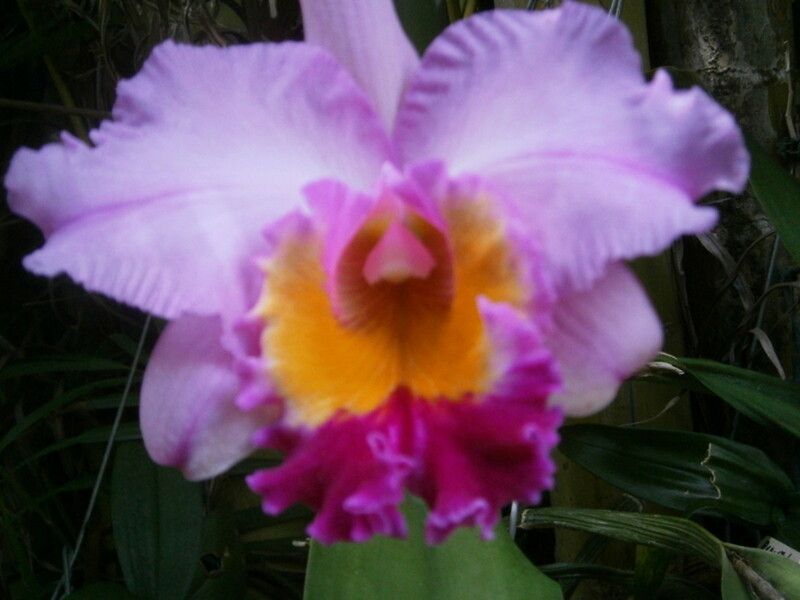 Hi rebeccamealey, thanks for reading about my Cattleya orchid. I wish I had a better camera to make sharper photos. My photos don't do the orchid justice. Have a good evening. Orchids are totally beauitful and your doing a great job with them. We lived 20 blocks from a California beach and grew them outside because of our mild climate. By the time we moved they were getting big. I sold them at our garage sale, not sure how for much now. Voted up and beautiful, Joyce. Orchids are so exotic! I too associate them with the prom. It looks like you did a fantastic job from your great pics! Hi HBN. Yes, I can't tell you how exciting it was when I first saw the bud coming. I was thinking: it's almost Mother's Day.....aren't you going to perform again this year? Last year it had two blossoms! I just wish I had a better camera. I'm putting out some hints for this Christmas. Thanks so much for the vote. Your excitement about and love for your cattleya orchid was palpable in this hub. I think it's wonderful that you've continued to care for it for nine years and are still so excited when it blooms near Mother's Day. I love orchids but have never tried to grow one. However, if someone I loved gave me one as a gift I would definitely try to keep it alive as long as possible. I voted this hub up, useful, awesome, beautiful and interesting.